Background: Hematologic malignancies cause significant morbidity and mortality and are not uncommon in resource-limited low-income countries. However, the types, pattern of presentation, and treatment outcomes vary across regions. We assessed the presentation and overall survival (OS) over an 11-year period in adult patients with hematologic cancers in Jos, North Central Nigeria. Materials: and Methods This retrospective outcome study evaluated patients who presented with hematologic malignancies between 2005 and 2015 at the Jos University Teaching Hospital, Jos. Variables of interest were abstracted through chart reviews. Descriptive statistics were used to evaluate baseline and follow-up parameters. OS was assessed by using Kaplan–Meier method. Results: Sixty patients, contributing 25,994 person-days of follow-up were evaluated. The mean age was 43 ± 17 years and 61.7% were males. Thirty-one patients (51.7%) presented with leukemia, 45.0% with lymphoma, and 3.3% with multiple myeloma. Forty-two (70.0%) presented with advanced disease, 5 (5.2%) were human immunodeficiency virus positive and 4 (6.7%) had died at the end of follow-up. OS was 84.3% (95% confidence interval: 58.1–94.7). Survival differed by disease group (P = 0.01) and having fever at presentation (P = 0.02). Conclusion: We found long-term OS to be impacted by disease type and status of fever at presentation. Disease-specific strategies to improve early diagnosis and therapies are needed to ensure optimal outcomes in Nigerian patients. Hematologic malignancies are malignant neoplasms arising from hemopoietic tissues. They comprise largely of malignancies like leukemia, lymphoma and multiple myeloma, of which leukemia and lymphoma are the most common globally., Hematologic malignancies comprise a fifth of the most commonly occurring cancers and the second leading cause of cancer deaths., Leukemia was the fifth most common cause of cancer deaths in men and the sixth most common in women in the United States in a 5-year study between 2007 and 2011. Hematologic malignancies were previously thought to be rare in north central Nigeria due to misdiagnosis, poor understanding of their pathogenesis and clinical presentation. No study has been conduct to understand the epidemiology of these diseases in Northern Nigeria. In most cases the etiology remain largely unknown. However, several factors have been identified to increase the risk of developing these cancers, including immunosuppression or immunodeficiency states,, infections with viruses such as human immunodeficiency virus (HIV), Epstein Barr virus, human T-lymphotrophic virus, and chronic bacterial infection like Helicobacter pylori. These immune-related risk factors are thought to be involved in a complex interplay of genetic damage in somatic cells arising from mutations or other defects, cytokine dysregulation and chronic antigenic stimulation resulting in development of these malignancies. Presentations of these cancers are usually nonspecific and may be influenced by associated factors like level of awareness of affected individuals, the type of the disease and other comorbidities. The outcomes in hematologic malignancies can also vary by time of presentation, type of the disease, stage of the disease at presentation, other comorbidities, availability and quality of the access to medical care. The objective of this study was to determine the pattern of clinical presentation, and overall survival (OS) of adult patients seen with hematologic malignancies between 2005 and 2015 in the Jos University Teaching Hospital (JUTH), Jos, North Central Nigeria. JUTH is a tertiary institution located in Jos, the capital city of Plateau State, North-Central Nigeria. It is a 550-bed facility and serves five neighboring states within the region. It offers specialist hematological services on both in and outpatient basis. The patients in this study were referred from clinics within the hospital, and from health facilities within the region between January 2005 and December 2015. The hematologists at the Department of Hematology and Blood Transfusion managed the patients, where all the cases were recorded in the case registry. This was a retrospective cohort study to determine the clinical presentation, and OS of adult patients seen with hematologic malignancies at the JUTH over an 11-year period. There were 121 cases recorded in the case register of the department of hematology and blood transfusion over the study period. The inclusion criteria were those on the register with documentation of diagnosis by bone marrow aspiration cytology or histology of tissue biopsy. Fifty-nine cases were excluded from this analysis for failure to meet the inclusion criteria as indicated in the flow chart [Figure 1]. Descriptive statistics was used to present baseline data, and they were expressed as proportions, mean (± standard deviation), and median [interquartile range (IQR)] as appropriate. The burden of hematologic malignancies was estimated using the number of all cancers that presented at JUTH during the same period as reference population. Bivariate analysis was used to describe the association with sociodemographic features and burden of hematologic malignancies in JUTH. Outcome was assessed based on status of patients, whether alive or dead at the last visit or follow-up. OS was assessed by using Kaplan–Meier method. STATA version 13.1 software package (STATA Corp, College Station, Texas) was used for the statistical analysis. A P-value <0.05 was considered significant. Sixty patients with hematologic malignancies were included in this study. The mean age of the study population was 43 ± 17 years. Majority (61.7%) were males, and most (86%) of the patients received formal education. About two-thirds (65.5%) were married, and 50.8% were employed at the time of presentation [Table 1]. Majority (71.2%) of the patients presented late, and the main clinical features they presented with were lymph node enlargement (63.2%), fever (48.3%), splenomegaly (47.4%), and hepatomegaly (42.1%). Hematologic malignancies constituted 4.4% of all malignancies at JUTH within the study period. The annual burden of hematologic malignancies was 0.4%. Among the hematologic malignancies, the highest burden was for leukemia (51.7%), and then lymphoma (45.0%), while multiple myeloma made up only 3.3%. 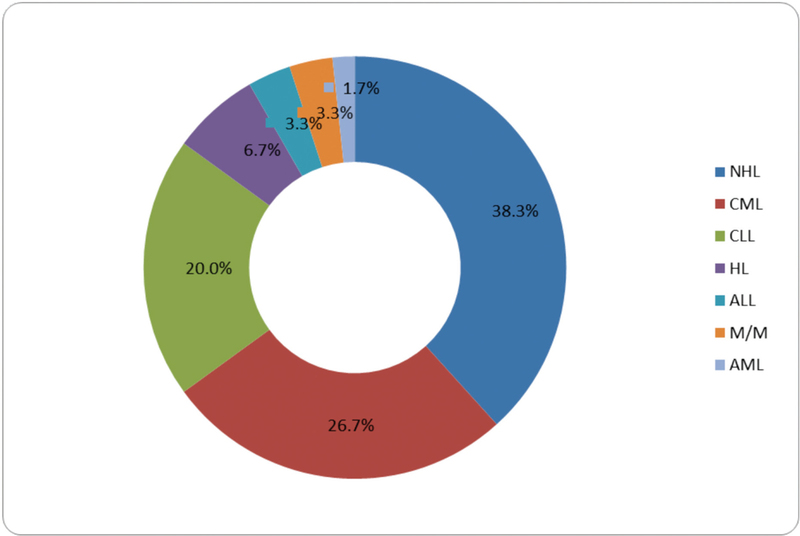 The distribution of histologic diagnosis of the various malignancies is shown in [Figure 2]. Non-Hodgkins lymphoma accounted for 38.3% of histologic diagnoses, followed by CML (26.7%) and CLL (20.0%). Other histologic types occurred in lower frequencies as shown in the doughnut plot. With regards to cytotoxic therapy, 86.2% received chemotherapy comprising nonpurine analog-alkylating agent-based combination in 38%, single-agent alkylator therapy (± steroid) in 32% and antibody-only or other therapy in 30% of those that accessed specific treatment. The median follow-up time for the whole cohort was 182 (IQR: 50–737) days. Patients with leukemia had shorter median follow-up periods (75, IQR: 21–382) compared to the patients with lymphoma (398, IQR: 103–1221) and multiple myeloma (161, IQR: 73–249), P = 0.03. Fifty-seven of the 60 patients had complete time-updated data and contributed 25,994 days of follow-up at the end of the observation period. OS was 84.3%; 95% confidence interval: 58.1–94.7% [[Figure 3]a]. When survival was stratified by sociodemographic and clinical variables, survival function differed only with disease group (P = 0.01, [Figure 3]b) and fever (P = 0.02), with age achieving borderline significance [Table 2]. Hematologic malignancies are not as rare in our environment as previously thought. These conditions are responsible for significant morbidity and mortality in individuals affected. In this study, they represented 4.4% of all cancer cases presenting in JUTH within the period under review and an annual burden of 0.4%. This burden of disease observed was lower than that reported by Kagu et al. in Maiduguri, North Eastern Nigeria where an overall burden of 6.05% was reported. The burden in our study was also lower than that reported from a study in Benin, South Southern Nigeria, where 17.4% burden was observed. The spectrum of clinical presentation in patients with hematologic malignancies varies depending on the type and stage of disease at which diagnosis was made. While some patients are asymptomatic, others present with symptoms attributable to effects of cytopenia and/or organ enlargement from infiltration with malignant cells. In this study, majority of the patients presented with lymph node enlargement. This is at variance with some studies, in which the most common features at presentation were nonspecific features of cytopenias (fatigue, fever, and bleeding tendency)., Other less frequent features such as splenomegaly and hepatomegaly seen in our patients have also been described in a study among aviators in India. In addition, nonspecific features including fever and bleeding tendencies, which were described in patients from other studies, were also seen in our patients. The most frequent abnormal laboratory finding in our patients in this study was leukocytosis. This was contrary to the finding reported in a study from Nepal, in which 90% of the patients with hematologic malignancies presented with cytopenias such as bicytopenia and pancytopenia. Cytopenias are reflection of the extent of bone marrow inadequacy resulting from infiltration of the bone marrow with the malignant cells. Leukocytosis was commonly seen among patients in this study and was closely followed by anemia, a manifestation of cytopenia. Thrombocytopenia was not a frequent presentation in our patients as reported elsewhere. In this study, 5.2% of the patients were positive for HIV. All those with a positive HIV status were found in the lymphoma group. This prevalence of HIV was higher than that reported in a study performed in Ile-Ife, Southwest Nigeria among lymphoma patients, in which 2.3% of the patients were HIV positive, but lower than the reported 26.5% positive HIV status in another study from Cameroon. The difference in HIV positive status may be explained by the regional variation of HIV prevalence in the general population. The finding of HIV positive status among the lymphoma cohort confirmed previous reports of infections with viruses such as HIV as risk factor for the development of lymphoma., Interestingly, no patient with leukemia, which had the highest burden for hematologic malignancies in our study, was HIV positive. A key strength of our study is the fact that we reported on an 11-year survival among patients with hematologic malignancies in a resource-limited setting and found OS to be over 80%. However, our study had some limitations. Firstly, the use of routine clinical data resulted in our inability to assess additional outcome measures (like rates of remission and disease free survival) due to missing/incomplete data. This limited our survival analysis to OS alone. We were, however, able to compare patients who were excluded due to missing data and those included in our final analyses and found them to have similar sociodemographic and disease characteristics. A prospective cohort will enable us fill in the gaps experienced in this study. Secondly, we were limited by the use of institutional data as there are no local cancer registries that would have enabled us compare trends in incidence and outcome. We do believe, however, that because the patients presented in this study were drawn from multiple centers/sites, our results are a fair representation of OS and can be generalized to our setting. Thirdly, our classification of the various cancers into three broad groups (leukemia, lymphoma, and myeloma) may have resulted in under and or over estimation of survival rates for some of the patients. Using grouping by histologic type may have been better. In conclusion, this study has shown that hematologic malignancies are not uncommon in our environment, and that OS is over 80%, even in the face of limited cancer management resources. We also observed similar disease patterns as have been previously documented in prior studies. The findings of this study can be used as a guide to plan future prospective studies that will enable the collection of more comprehensive data, which will speak to some of the limitations encountered in this study and enable better planning and implementation of cancer prevention and treatment programs. We are grateful to the patients who contributed data to this study and the staff of the health records department for case file retrieval. This study was supported by Northwestern University and Jos University Research Training Program in HIV and Malignancies (award number D43TW009575) from the Fogarty International Center, National Institutes of Health (NIH), USA. The content is solely the responsibility of the authors and does not necessarily represent the official views of the Fogarty International Center or the National Institutes for Health. Smith A, Howell D, Patmore R, Jack A, Roman E. Incidence of haematological malignancy by sub-type: A report from Haematological Malignancy Research Network. Br J Cancer 2011;105:1684-92. Mandong BM, Madaki AK, Mannaseh AN. Malignant diseases in Jos: A follow up. Ann Afr Med 2003;2:49-53. Global Burden of Disease Cancer Collaboration. Global, regional, and national cancer incidence, mortality, years of life lost, years lived with disability, and disability-adjusted life-years for 32 cancer groups, 1990 to 2015: A systematic analysis for the global burden of disease study. JAMA Oncol 2017;3:524-48. doi:10.1001/jamaoncol.2016.5688. Burns R, Leal J, Sullivan R, Luengo-Fernandez R. Economic burden of malignant blood disorders across Europe: A population-based cost analysis. Lancet Haematol 2016;3:e362-70. Cohen J, Pivodic L, Miccinesi G, Onwuteaka-Philipsen BD, Naylor WA, Wilson DM et al. International study of the place of death of people with cancer: A population-level comparison of 14 countries across 4 continents using death certificate data. Br J Cancer 2015;113:1397-404. Lehmann L, El-Haddad A, Barr RD. Global approach to hematologic malignancies. Hematol Oncol Clin North Am 2016;30:417-32. Park LS, Tate JP, Rodriguez-Barradas MC, Rimland D, Goetz MB, Gibert C et al. Cancer incidence in HIV-infected versus uninfected veterans: Comparison of cancer registry and ICD-9 diagnoses. J AIDS Clin Res 2014;5:1000318. Hamid GA. The pattern of haematological malignancies at the Al-Gamhouria Teaching Hospital, Aden, Yemen, from 2008 to 2010. Turk J Hematol 2012;29:342-7. Savage DG, Szydlo RM, Goldman JM. Clinical features at presentation in 340 patients with chronic myeloid leukaemia seen at a referral centre over a 16-year period. Br J Haematol 1997;96:111-6. Abel GA, Friese RC, Magazu LS, Richardson LC, Fernandez ME, De Zengotita JJ et al. Delays in referral and diagnosis for chronic hematologic malignancies: A literature review. Leuk Lymphoma 2008;49:1352-9. Lister TA, Crowther D, Sutcliffe SB, Glatstein E, Canellos GP, Young RC et al. Report of a committee convened to discuss the evaluation and staging of patients with Hodgkin’s disease: Cotswolds meeting. J Clin Oncol 1989;7:1630-6. Vardiman JW, Harris NL, Brunning RD. The World Health Organization (WHO) classification of the myeloid neoplasms. Blood 2002;100:2292-302. Kagu MB, Ahmed SG, Bukar AA, Mohammed AA, Mayun AA, Musa AB. Spectrum of haematologic malignancies and survival outcomes of adult lymphomas in Maiduguri, northeastern Nigeria − A fourteen-year review. Afr J Med Med Sci 2013;42:5-14. Idris M, Shah SH, Fareed J, Gul N. An experience with sixty cases of haematological malignancies: A clinic haematological correlation. J Ayub Med Coll Abbottabad 2004;16:51-4. Hossain MS, Iqbal MS, Khan MA, Rabbani MG, Khatun H, Munira S et al. 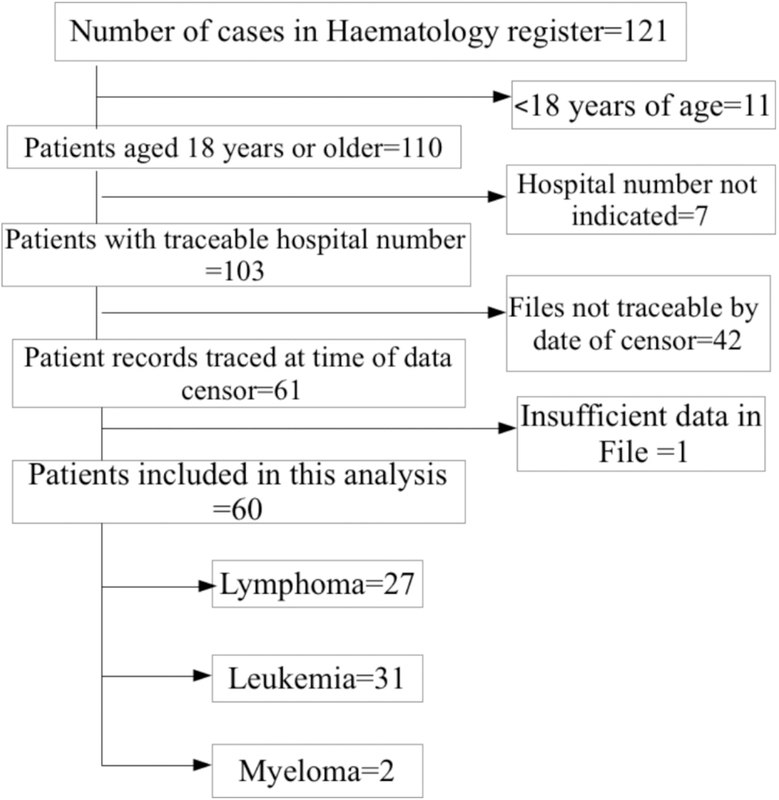 Diagnosed haematological malignancies in Bangladesh − A retrospective analysis of over 5000 cases from 10 specialized hospital. BMC Cancer 2014;14:438. doi:10.1186/1471-2407- 14-438. Weldetsadik AT. Clinical characteristics of patients with haematological malignancies at Gondar University hospital, North West Ethiopia. Ethiop Med J 2013;51:25-31. Obafunwa JO, Akinsete I. Malignant lymphoma in Jos, Nigeria: A ten-year study. Cent Afr J Med 1992;38:17-25. Williams CK. Neoplastic diseases of the haemopoietic system in Ibadan: Preliminary report of a prospective study. Afr J Med Sci 1985;14:89-94. Ganjoo RK, Chadha DS, Sharma SK, Kasthuri AS. Spectrum of hematological malignancies in aviators − A clinical series. Ind J Aerosp Med 2009;53:45-51. Jha A. Spectrum of hematological malignancies and peripheral cytopenias. J Nepal Health Res Counc 2013;1:273-8. Bolarinwa RA, Ndakotu MA, Oyekunle AA, Salawu L, Akinola NO, Durosinmi MA. AIDS-related lymphomas in Nigeria. Braz J Infect Dis 2009;13:359-61. Mbanya DN, Minkoulou EM, Fezeu L, Kaptue L. Impact of HIV-1 infection on survival in patients with haematological malignancies in Yaoundé, Cameroon. Trop Doct 2007;37:151-2. American Cancer Society. Global Cancer Facts & Figures. 3rd ed. Atlanta: American Cancer Society; 2015. p. 24-6. Musa J, Nankat J, Achenbach CJ, Shambe IH, Taiwo BO, Mandong B et al. 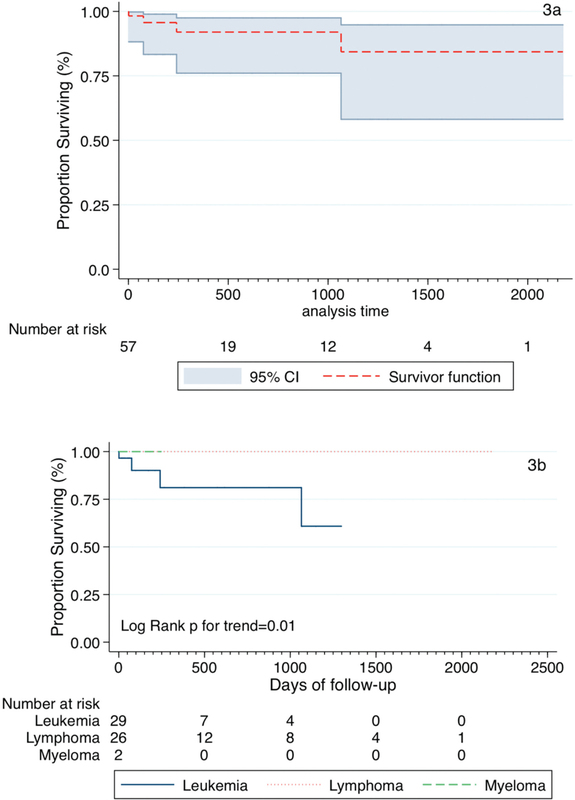 Cervical cancer survival in a resource-limited setting − North Central Nigeria. Infect Agent Cancer 2016;11:15. doi:10.1186/s13027-016- 0062-0. Abdel-Wahab M, Bourque JM, Pyanda Y, Iżewska J, Van der Merwe D, Zubizarreta E et al. Status of radiotherapy resources in Africa: An international atomic energy agency analysis. Lancet Oncol 2013;14:e168-75. Kingham TP, Alatise OI, Vanderpuye V, Casper C, Abantanga FA, Kamara TB et al. Treatment of cancer in sub-Saharan Africa. Lancet Oncol 2013;14:e158-67. Gopal S, Wood WA, Lee SJ, Shea TC, Naresh KN, Kazembe PN et al. Meeting the challenge of hematologic malignancies in sub-Saharan Africa. Blood 2012;119:5078-87. Efficace F, Cartoni C, Niscola P, Tendas A, Meloni E, Scaramucci L et al. Predicting survival in advanced hematologic malignancies: Do patient-reported symptoms matter? Eur J Haematol 2012;89:410-6. Borate U, Mineishi S, Costa LJ. Nonbiological factors affecting survival in younger patients with acute myeloid leukemia. Cancer 2015;121:3877-84. doi:10.1002/cncr.29436.